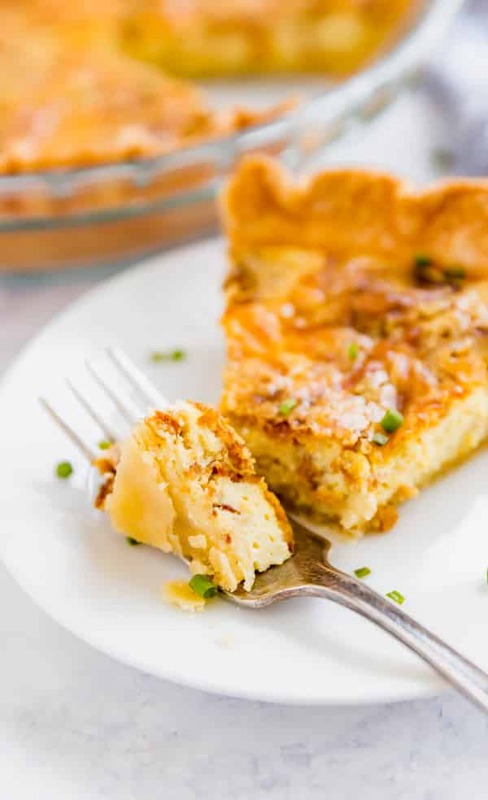 Is there anything better than Classic Quiche Lorraine? 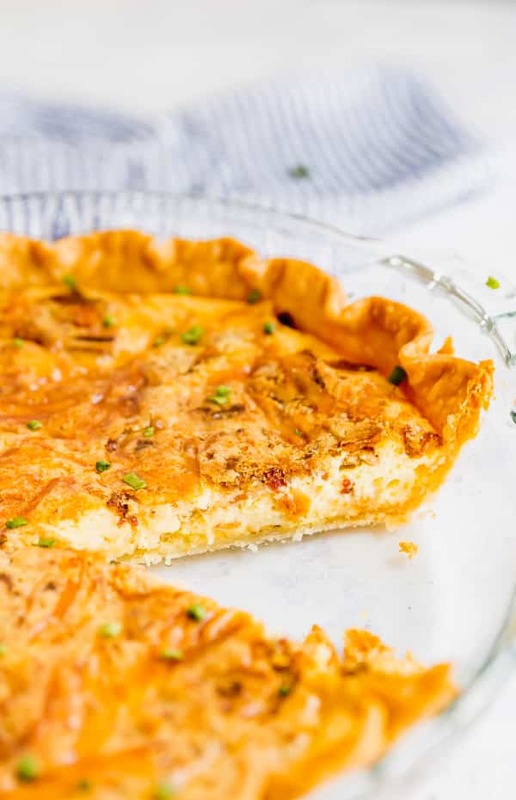 Simple ingredients, minimal steps and a delicious quiche to elevate any brunch! Ugh, I seriously love quiche. If I make a quiche, I will eat it all week long. For some unknown reason, I’m the only person in my house that eats them and I’m not even a little bit sad about it. More quiche for me! So I decided to bring it back to an old classic. 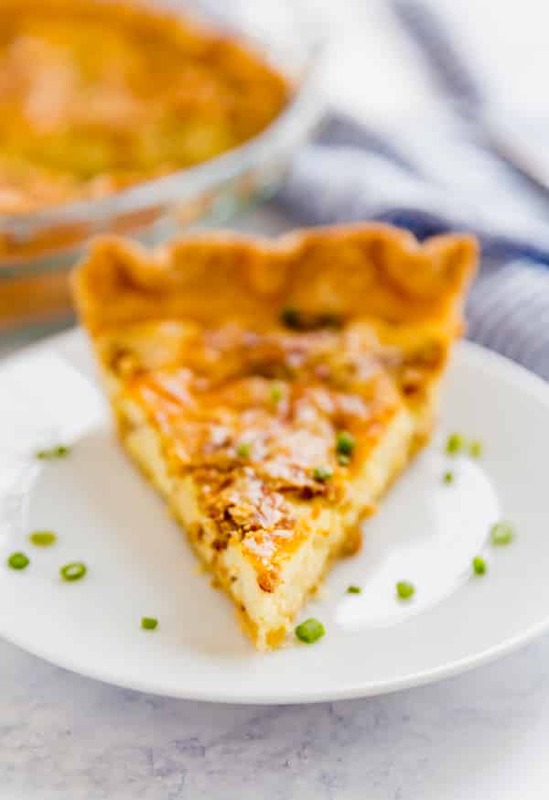 Is Quiche Lorraine the original quiche recipe? I don’t know for sure. All I know is it’s seriously delicious in it’s simplicity. Now you could always kick it up a notch. 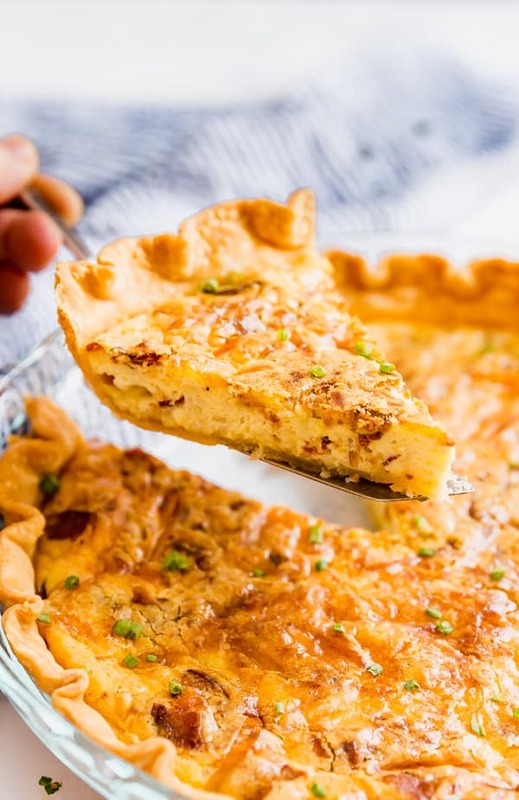 There are a whole slew of add-ons that can easily elevate any basic quiche recipe. But I think it’s the aforementioned simplicity that makes this easy quiche so fantastic! Use a pre-made pie crust. Work smarter, not harder. Make sure you don’t sub out the heavy cream. This is important. I’ve tried to make quiches with whole milk before and it’s just not the same. You need that higher fat content to get that perfectly custardy filling. Hold out a small portion of the cheese to sprinkle over the top after you’ve added the egg mixture. It will help in getting that gorgeously golden top. 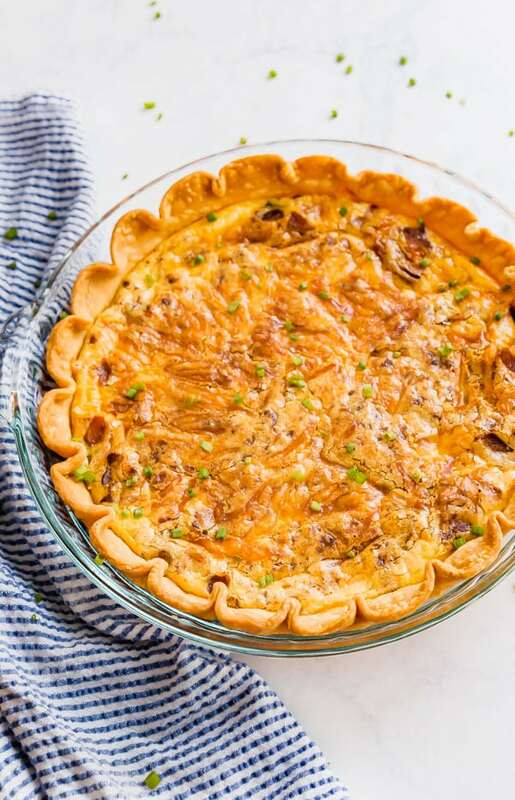 Keep an eye on the crust and if necessary, add a pie crust shield to make sure it doesn’t overcook. 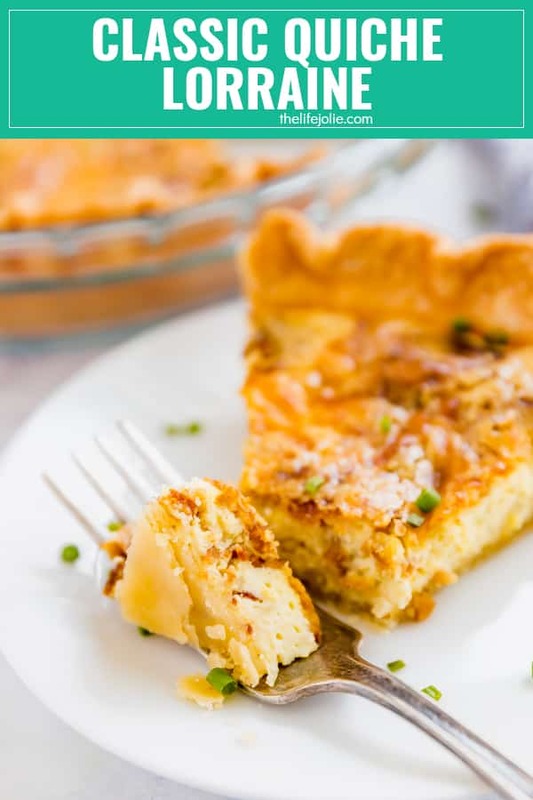 You’ll know the quiche is cooked through when it’s no longer jiggly in the middle. Place pie crust in the pie plate and crimp. Set aside. 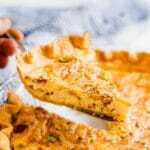 Place all but 1 Tablespoon of the bacon and all but 1 Tablespoon of the cheese into the pie crust and gently mix with your fingers. Whisk together eggs, cream, salt pepper, nutmeg and onion powder until well combined. Pour into pie crust and sprinkle remaining cheese and bacon on top. Bake for 45-50 minute or until the middle is set keeping an eye on the crust to make sure it isn't overcooking (add a shield if necessary). Cool and serve or refrigerate until you're ready to serve. Garnish with chives or parsley. 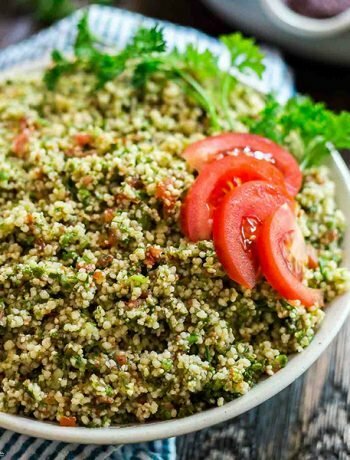 This lasts for 4-5 days in the refrigerator. 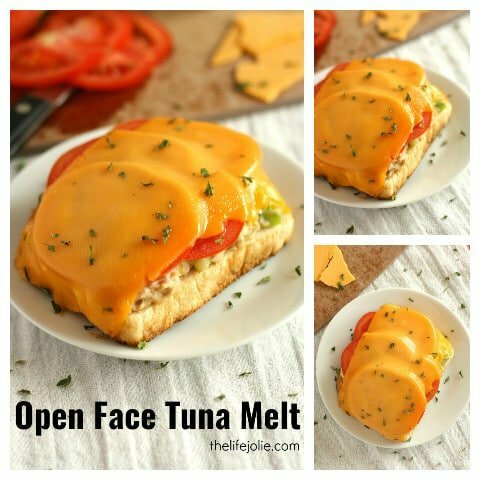 Looking for some other tasty brunch recipes? April 6, 2018 at 2:52 pm It looks perfect! Simply perfect!